Before the Moosling was born, we went on a big bike tour of the more traditional style, with Surly Long Haul Truckers and panniers. But even on that ride we were seeking out gravel roads and connectors as much as we could. Our heart was with the gravel and singletrack, and so our first overnight bike trip with him four years ago turned into the beginning of our love of bikepacking – and the beginning of our trying to acquire better gear for it too. I’ve been thinking about packing lists, and the logistics of travelling with kids recently. 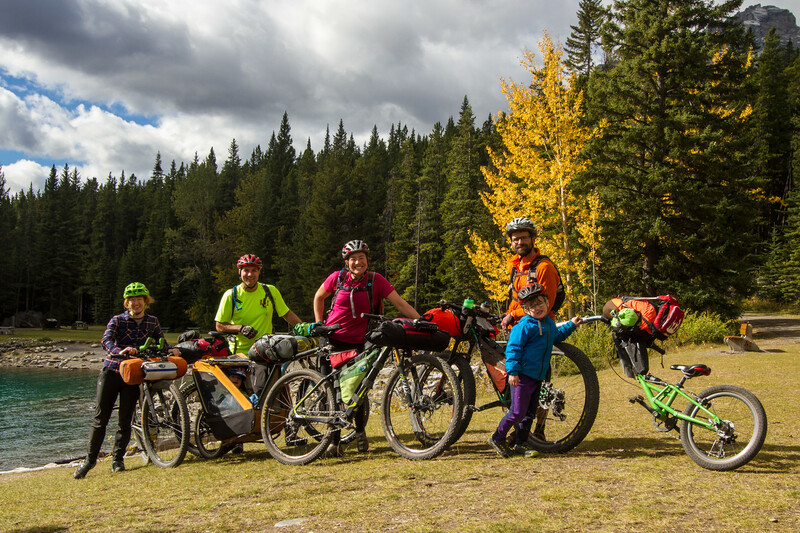 Partly because we just took Kat and Mike on their first bikepacking trip. 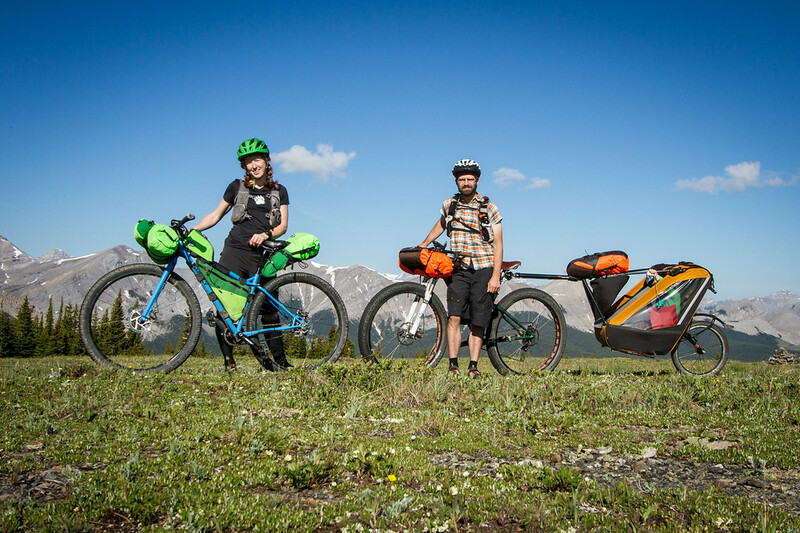 Partly because I was getting ready to present at the Bikepack Canada conference on the subject of bikepacking with kids. And partly because someone (thanks Christina!) asked about it on my last bikepacking post. First up, here’s some of the setups we’ve used over the last few years. Just a Chariot with a backpack strapped to it and a shopping bag hanging off the back. I think I was just carrying a backpack too. This is the year we got the Tout Terrain Singletrailer! It meant we were able to get out into all sorts of terrain that just wasn’t accessible with the Chariot, and opened up a lot more local route options without having to pedal on gravel roads. We still didn’t have any ‘proper’ bikepacking gear, but were just wearing running backpacks and strapping stuff to our bikes (not very well). I upped my water carrying capacity by clamping bottle holders to my fork – which can go wrong if they’re not on solidly, but it was fine for this trip. We got awesome bike bags from Porcelain Rocket! This made life much easier, but in hindsight enabled us to start bringing along more gear than we had done in 2013, and so a heavier load. 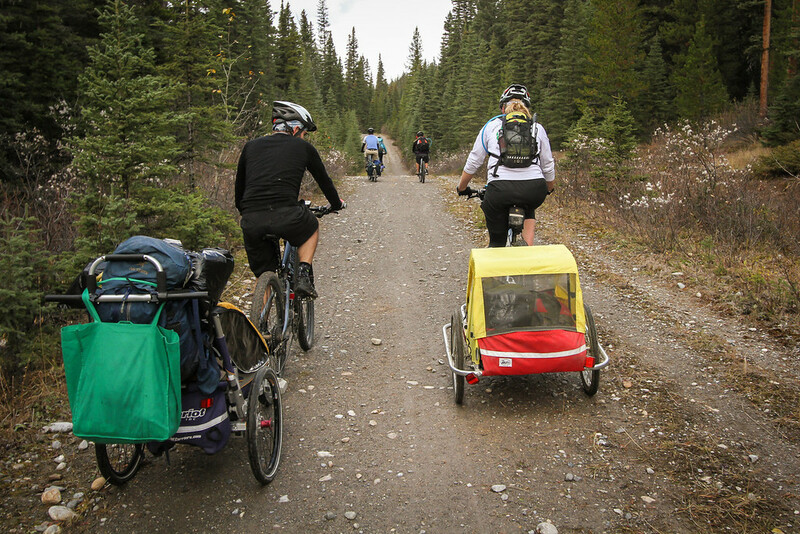 The switch to travelling with the trail-a-bike. Our setup was otherwise mostly the same, but we ended up strapped a seat bag and a handlebar bag to the handlebars of the trail-a-bike. More of the same in 2016, although we’ve started managing to get out bikepacking with other families. More of this to come in 2017 I hope! And maybe even in winter 2016-2017. 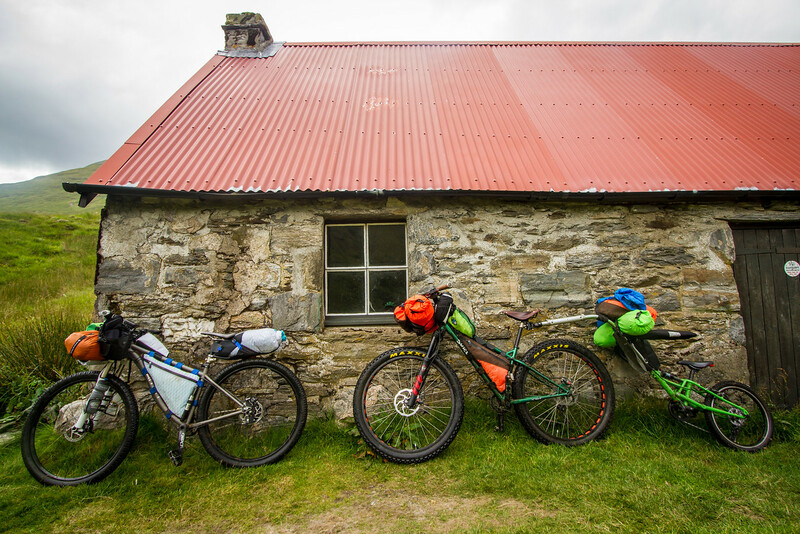 Below is our list of gear we’d consider taking on a one or two night trip, showing how it’s morphed over the years as we acquired new gear and the kiddo got bigger. Some items are luxury items that we’d only bring along on an overnight trip – others we could get away without on a short trip, but would definitely want along for a longer trip. Disclaimer: With only one kid we can get away with taking more luxuries while still travelling lighter than people out there with extra kiddos. As always, your mileage may vary – your essentials may be unnecessary for our comfort, and our favourite items may seem weird and unusual to you. We’re always working on refining our packing and gear too – slowly, some of our heavier items are being replaced (yes, I’m super excited that we’ll finally be getting rid of our ancient pock-marked Aluminium ex-Tefal coated pots this Christmas) and we’re always trying out new ways of doing things. The best way to find out what you need is to head out for an overnight trip and start experimenting. We used to use a Tarp Tent Rainshadow 2. It was very light (1.2kg) and packed small, but we found we were often getting cold in it, and there wasn’t a lot of space in the tent given how large the footprint was. Then for a while we were using our old Big Agnes Seedhouse 2 (1.36kg). It’s a great tent, but as Finn got bigger, we decided to upgrade to a Big Agnes Copper Spur UL3. It’s what we’re using now, and is a little heavier at 1.8kg, but has kept as perfectly warm when we’ve been using it in temperatures as cold as -5oC. If the weather’s looking great we’ve left the fly behind and it’s just 1.3kg. We really like having the mesh to keep the bugs out. This summer hasn’t been too bad, but sometimes we’re camping in a sea of bugs. And having two doors and two vestibules is great for being able to sneak in and out of the tent around a fast asleep kid (or tired out parent). We’ve used a range of things here. When Finn was small, it was our old Prolite Thermarests, plus just throwing some extra layers on the floor of the tent. I always seemed to end up sleeping on the cold tent floor without a mat (and despite my best efforts, I just don’t seem to sleep well without a mat). So we tried bringing a basic foam/ridge mat for him. That never worked out well, it wouldn’t stay put. These days we’re all on Neoair Thermarests, two regular length and one 3/4. That’s working well, and they’re pretty light. Once he got big enough that he wouldn’t fit in fleecey sleep suits, I made a down quilt and we tried sharing that. As he grew, it no longer really worked to have us all in there. So we tried having him in an enLIGHTened equipment ProtegeX sleeping bag (synthetic insulation, very light). When he was small he would always squirm out of it and end up under the down quilt with Alex, while I tried to drape his tiny sleeping bag over me to maintain some level of warmth when I was kicked off my thermarest and out from under the quilt. But the past couple of summers he’s been really good about sleeping in his bag, and then we’ll either bring two sleeping bags for the adults, or just the down quilt if it’s warmer. Sleeping bag liners also help for extra warmth. I’ll be hacking up my 15 year old down sleeping bag and converting it into a kids bag for him this winter, as he’s getting to the point of outgrowing his Enlightened Equipment bag. Here we just use what we already had – an ancient MSR pot set, heavy spandongles, 3x titanium sporks. We’re currently using an MSR Pocket Rocket for a stove. Cutting knife & spreading knife. Small and light washing kit – teatowel, scrubber, Dr Bronners (we don’t always bring these). Also a couple of flatpack plates/bowls from Orikaso – they’re bombproof and have been with us since 2008. Sometimes we’ll bring mugs as well. Water – depending where we’re going we try to carry at least 1L each. We’ve tried using a water filter, Steripen, Aquatabs (or similar) and Pristine, but our favourite is the Pristine system. Having to spend the time sitting around while we are getting water is never an issue, it’s actually preferred for entertainment value. Dinner- we often do some kind of pasta, tuna, cheese and veggies variant, but are probably going to get more into dehydrated meals in the future. Easier to manage in camp if we’re just boiling water! Legs: shorts, sometimes long pants, sometimes thermals, sometimes rainproofs, often fleecy pants for the kid,underpants, socks, shoes. No extra shoes for camp usually. Top: t-shirt/jersey, then some combo of wind shirt/light shell/light fleece/softshell/heavy shell jacket/down sweater – weather dependent. Extremities: gloves (sometimes also warmer gloves/shell mitts), buff, toque/warm hat, sunglasses. No extra shoes for camp usually. For Finn we’ll bring extra pants, underpants, socks and upper body layer. When he was small we tried cloth diapers (a hassle to cart around wet, but doable overnight), disposable diapers (last a long time and light before use) and biodegradable diapers (as we’re alpine so often, the main benefit was being able to shred them into backcountry long-drops, or burn them, if necessary). Sunscreen, chapstick, 1000 WETWIPES!, hand sanitiser, TP, toothbrushing things, first aid kid (we keep the first aid kit pretty light, but include tick remover, fire, bandaids, sling & roll bandages, hand warmers). Spare plastic bags (especially when he was younger, for diapers or possible potty training accidents). Some of these things are left behind if we’re just going for a night, or depending on the weather, but wet wipes always come. Sometimes a pack of cards. Bear spray and bear bangers. Plus helmets, bikes, bike repair gear! I’m looking forward to refining our setup a little more for next summer, and lightening it a little. 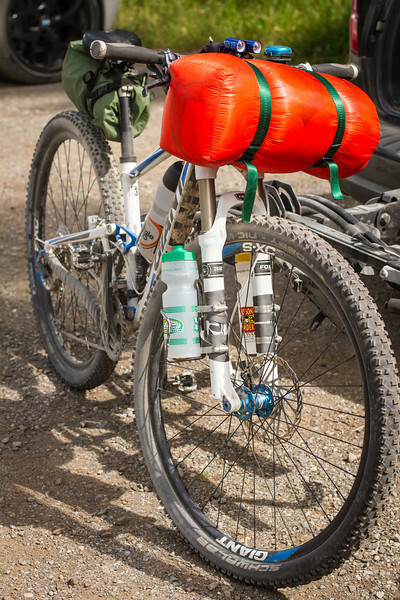 But hopefully getting in our first winter bikepacking trips before then too! Excellent! 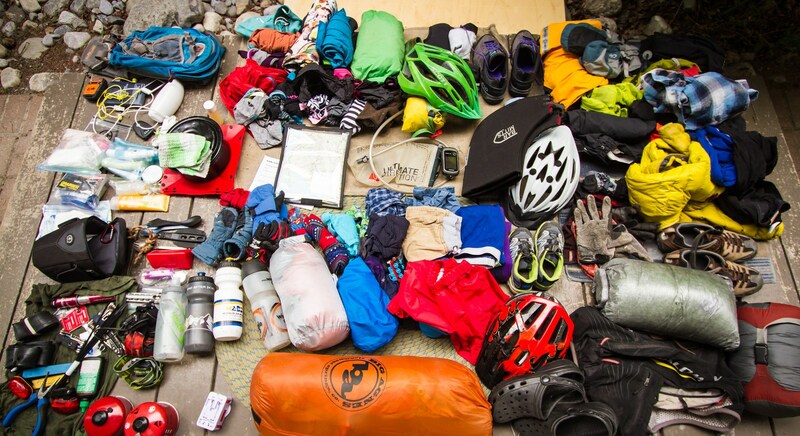 Thank you for the reality check on the evolution of packing systems and gear selection. This was really helpful. No worries :) It was actually interesting to get it all down and think about it.